It is possible do drive from Baie Comeau, QC to Blanc Sablon, QC save for one overnight ferry (and that ferry will be replaced by a road in 2009!). Why would anyone want to drive thousands of kilometers through the Canadian Shield to finish at a dead-end? Because you can! 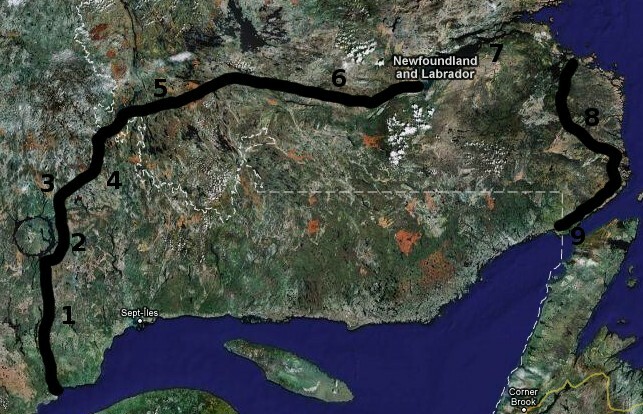 This website documents our journey across the Trans-Quebec-Labrador Highway in the Summer of 2008. Hope you find the info useful. When we were planning our trip, there wasn't much to help us. Click Next to begin. Image taken from Google Maps, modified to show route.